EasyTurf is scheduled to showcase their industry leading synthetic turf at the San Diego Kids Expo & Fair on Saturday and Sunday Oct 18, 19 in Del Mar, Calif. The display includes an interactive look at the ingenious engineering involved in the creation of their artificial grass and proprietary MaxxFlow backing. "EasyTurf has been an innovator of synthetic grass landscaping and has taken a leading role in educating consumers of our many benefits," said Dave Hartman, EasyTurf President. "We’re excited to join the San Diego Kids Expo at the Del Mar Fairgrounds and show homeowners how we can improve their homes and quality of life for the entire family." EasyTurf uses a proprietary 100 percent permeable artificial grass playground surface backing, MaxxFlow, for unmatched drainage capabilities. Unlike a grass lawn, rain will not turn your EasyTurf surface into a mud pit. Natural grass lawns require regular maintenance, tremendous amounts of water, pesticides, herbicides, fertilizer and time. EasyTurf’s durability is also unmatched. "EasyTurf’s superior synthetic grass products are matched by a dedication to exceptional craftsmanship and customer service," Hartman said. "Our commitment to excellence continues to attract homeowners and commercial businesses searching for functional, aesthetic improvements." EasyTurf is also replacing traditional backyards and commercial playground surfacing like rubber tiles and wood chips across the country. EasyTurf is safer, cleaner and softer than the old standard playground surfacing. At the same time, EasyTurf is extremely durable, yet non-abrasive, providing longevity and a comfortable commercial playing surface. Studies show that falling down contributes up to 80% of all playground injuries. We can’t stop kids from being kids – who would want to? 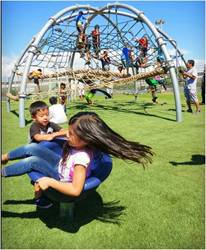 - but we can improve the safety of their playground surface area. EasyTurf’s FallSoft™ technology incorporates a water permeable safety pad installed beneath the product to provide additional protection against falls from play equipment. Certified by the International Playground Equipment Manufacturers Association, EasyTurf surpasses the ASTM 1292 fall height requirements for up to 9 ft. (14′ heights can be certified with additional ASTM testing) feet and meets ASTM 1951 ADA certification requirements. World renowned dog whisperer, Cesar Millan recently introduced EasyTurf artificial grass as his turf-of-choice for pet owners. Millan says drainage was critical in his decision to partner with EasyTurf on the 10,000 sq. ft. installation of artificial grass at his Dog Psychology Center in Santa Clarita, Calif.
"We have a lot of land to cover, so it’s important to me that our landscaping is easy to care for, safe for our pack and has proper drainage," said Millan. "Not only does Easy Turf look just like natural grass, it helps to eliminate common lawn problems associated with pets like brown spots from urine, tracked in mud, grass clippings and it can even deter your dog from digging holes." EasyTurf, the landscape division of FieldTurf, plays an important role in environmentally friendly lawns, recreational fields, playgrounds and energy conservation plans for communities throughout North America. In May 2010 EasyTurf, Inc., a long-time distributor of FieldTurf line of landscaping products and a recognized leader in the artificial grass industry, became the national brand of FieldTurf landscape, pets, playground, and golf artificial grass products. The partnership allowed FieldTurf to rapidly expand its existing dealer network and accelerate sales and distribution of FieldTurf landscape products on a national level to homeowners, municipalities, schools, businesses and the military. EasyTurf is North America’s preeminent source for landscaping, offering state-of-the-art synthetic lawns for realistic, beautiful, easy-care residential and commercial landscapes, providing specialty synthetic grasses engineered specifically for military surfaces, commercial and residential athletic and playground surfaces, putting greens, and for pet-friendly landscapes. EasyTurf product advancements in the synthetic grass industry have led to massive growth for the Vista, California-based leader in life-like artificial lawns that stay beautiful year round. FieldTurf has long been the world leader in synthetic sports field cover; now EasyTurf is poised to equal that success in the residential and commercial artificial grass landscaping markets.